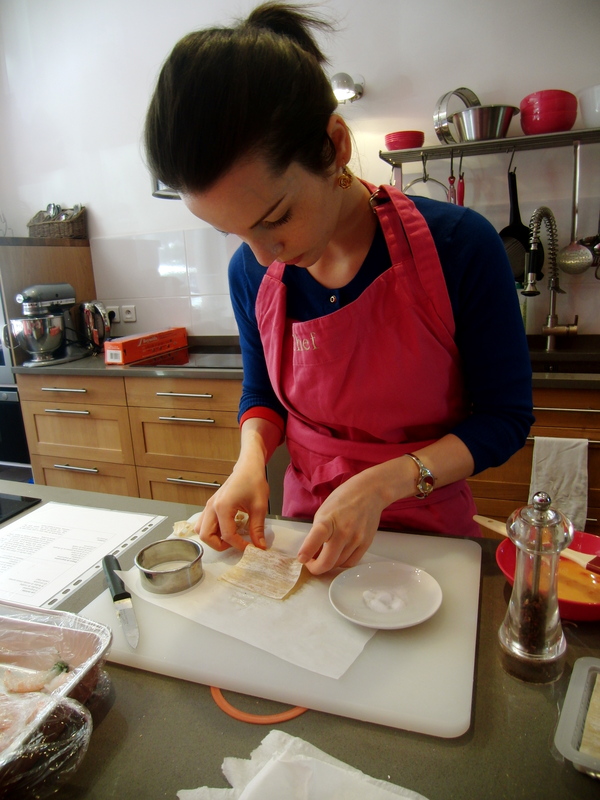 Made with love and muscles in Chef Noemie’s kitchen at Les Secrets Gourmands de Noemie. This was one of my most beloved dishes during my culinary adventure in Paris. It took a lot of muscle and man power to make the langoustine sauce… a lot of work for just a smidge of sauce, but it is worth the effort. Making the raviolis is a simple activity, and might be fun to do with friends during a dinner party. Have the sauce prepared (because you didn’t invite them over to truly work) and then set up your mise en place for the raviolis. They will be blown away by how easy it is to prepare such an artistic, elegant course. The mint is a subtle but necessary flavor, and it accents the fish perfectly. The sauce is light in consistency; no one would guess the amount of cream involved, nor is it thin and watery. For those of us in the states who can’t get their mitts on langoustines, this dish can be recreated with nearly any shellfish. Try lobster, shrimp, crayfish, crab, or even sea bass. 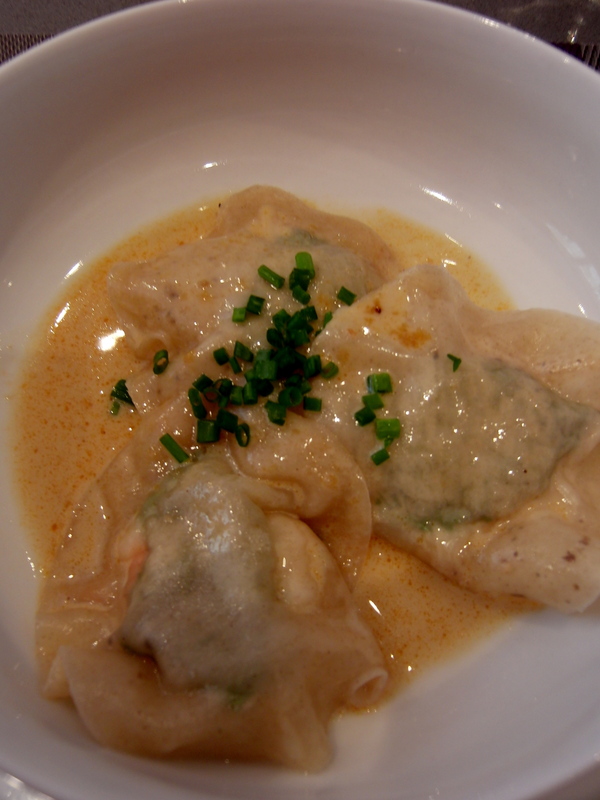 For the vegetarian, wild mushroom or spinach ravioli are two of my favorites. 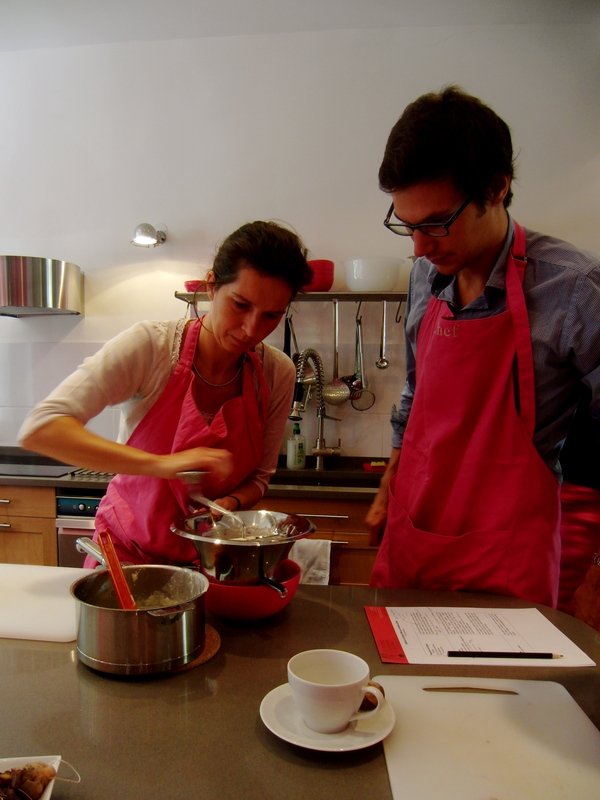 Made with love and muscles in Chef Noemie’s kitchen at Les Secrets Gourmands de Noemie, the stellar, intimate cooking school in Paris’ chic Batignolles neighborhood. 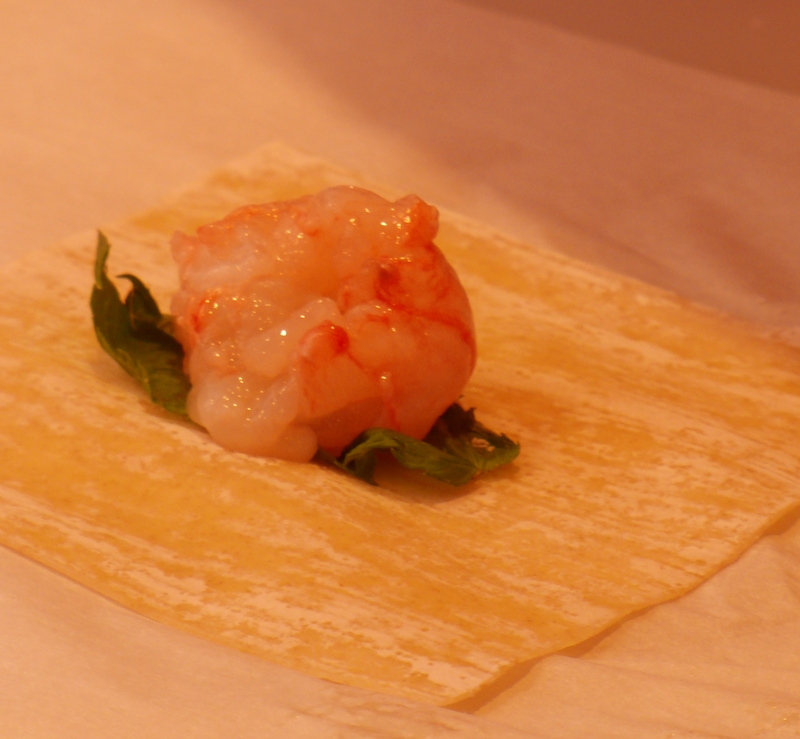 Ingredients (for 18 ravioles): 18 langoustines, 18 mint leaves, 36 Chinese ravioli squares, 1 egg yolk, salt, pepper, and coarse salt. 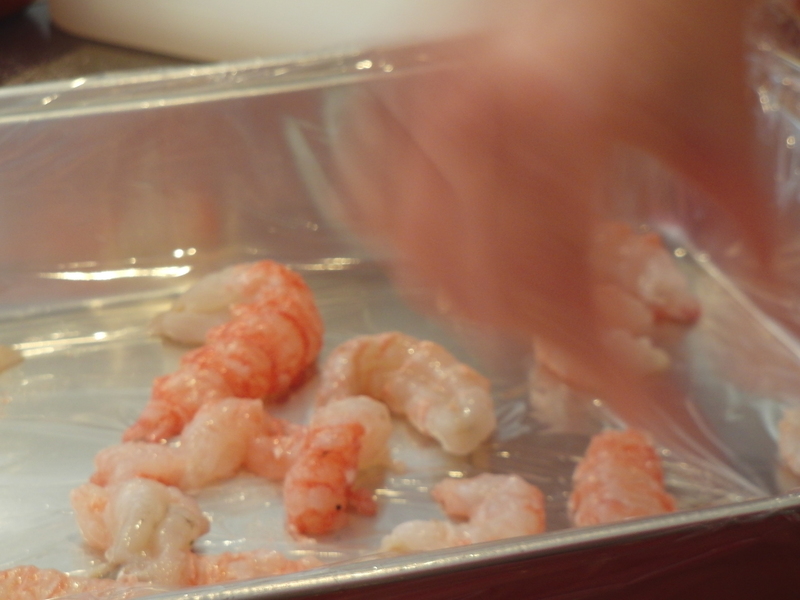 To prepare the ravioles: Shell the langoustines. Keep the legs and heads. Flour the table and spread the ravioli squares. 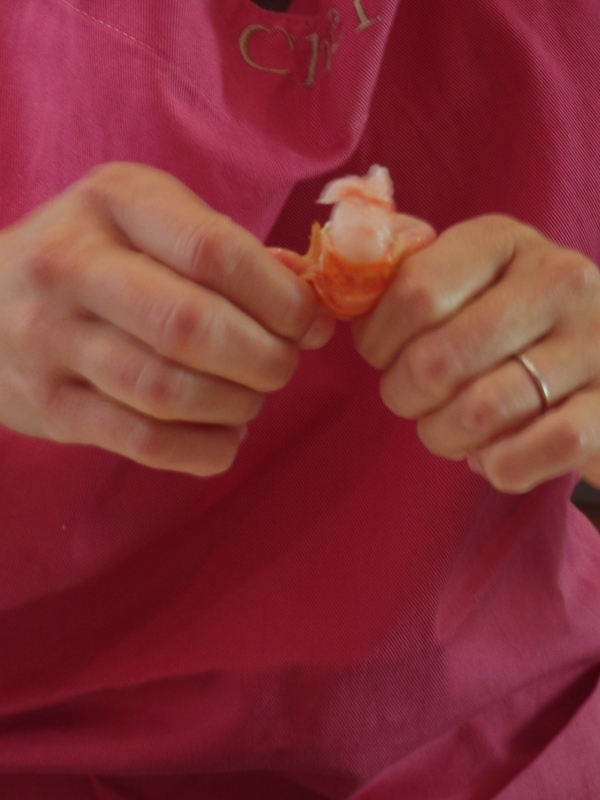 Place a mint leaf and a langoustine in the center. 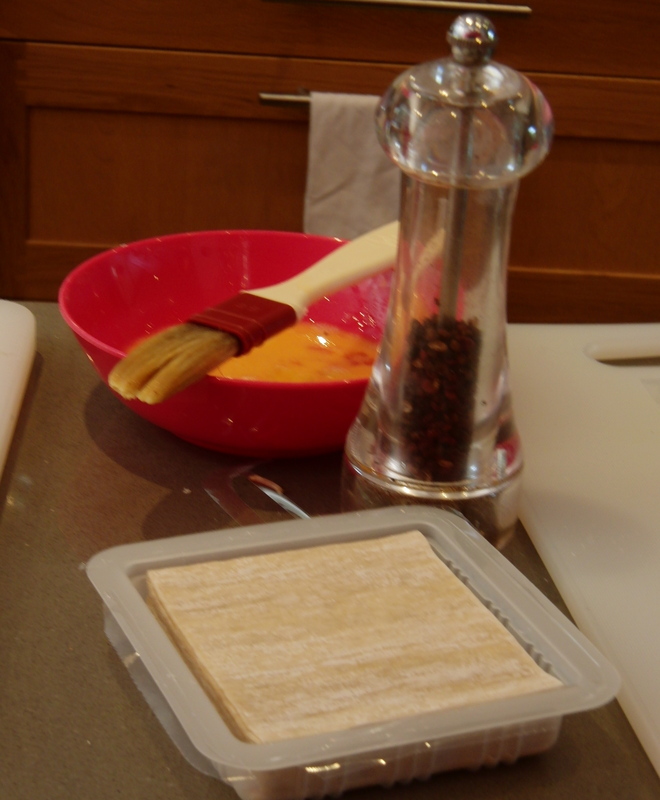 Season with salt and ground pepper. Brush the ravioli edges with the egg yolk. 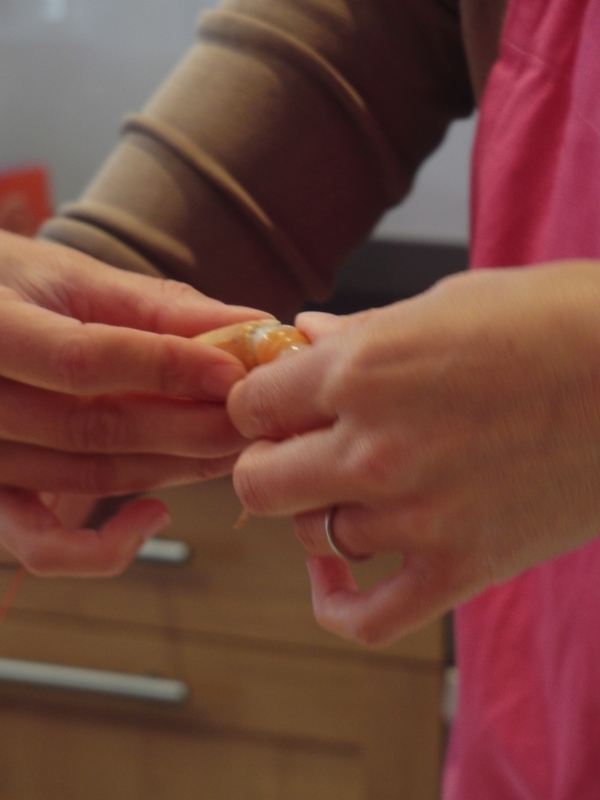 Place a second ravioli over it and seal it with your fingers. Use a cookie cutter or the edges of a glass to shape the ravioli. Chill the raviolis until you are ready to cook them. 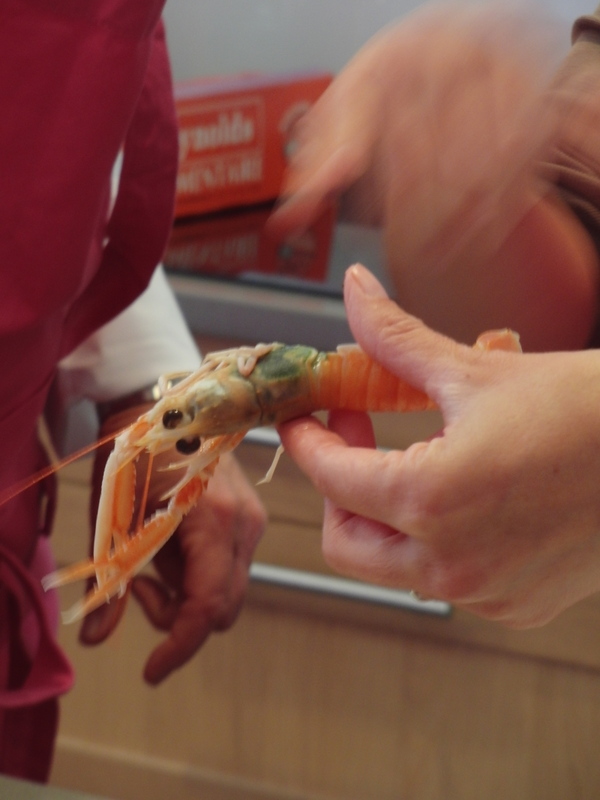 To prepare the langoustine sauce: Crush the langoustine legs and heads. In a large pan, heat one tablespoon of olive oil. Add the shallots and cook until tender. 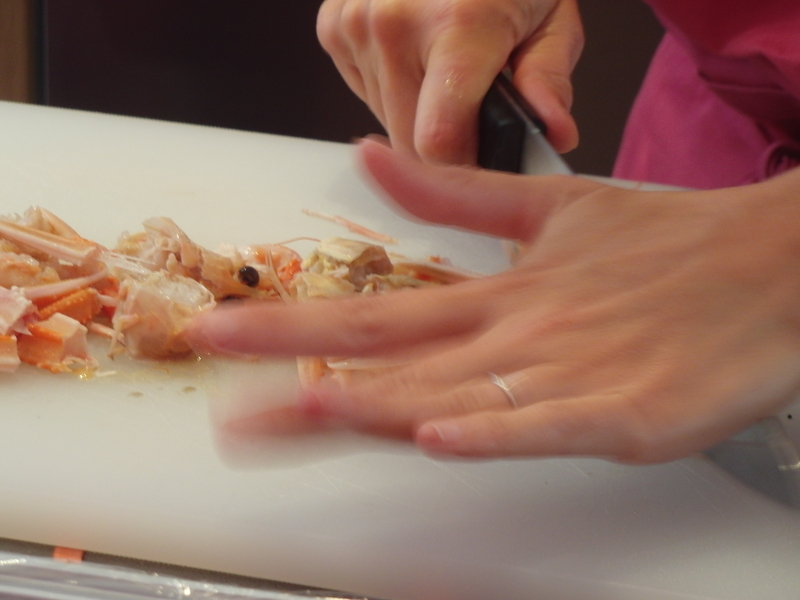 Add the crushed langoustine parts. Stir to combine and add more olive oil if it is looking dry. Cook for 8-10 minutes. Take the pot off of the flame and flambe with cognac (absolutely don’t flambe over the flame!). When the brandy has evaporated, add the white wine, put the pot back over the flame and cook until evaporated. 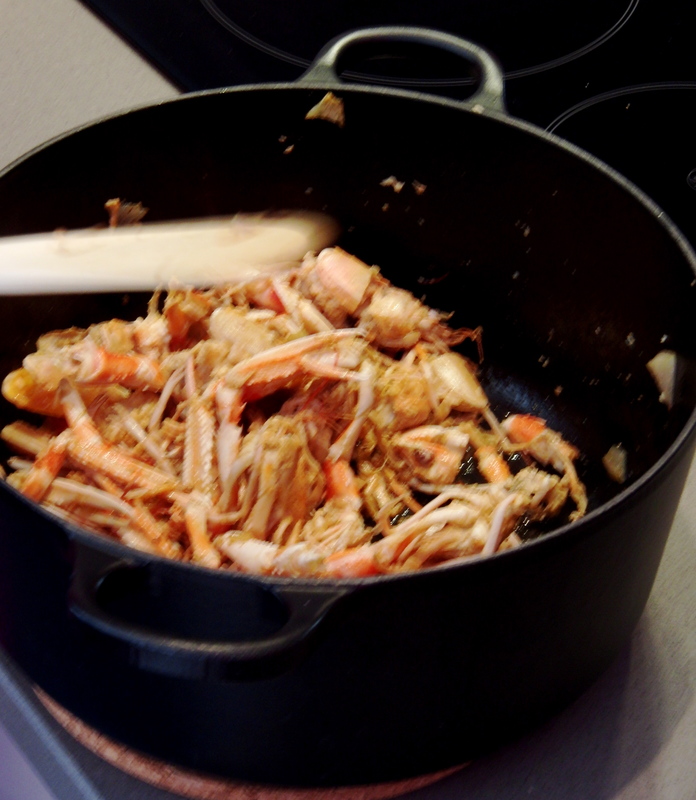 Keep stirring and crushing the langoustines (this is a constant process). 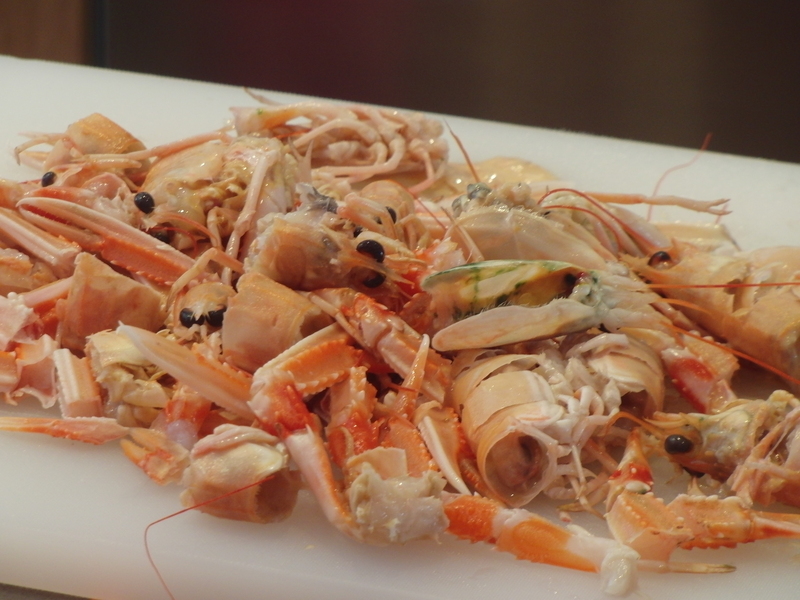 Add the fish stock and cook for 15 more minutes, continuously crushing the langoustines. 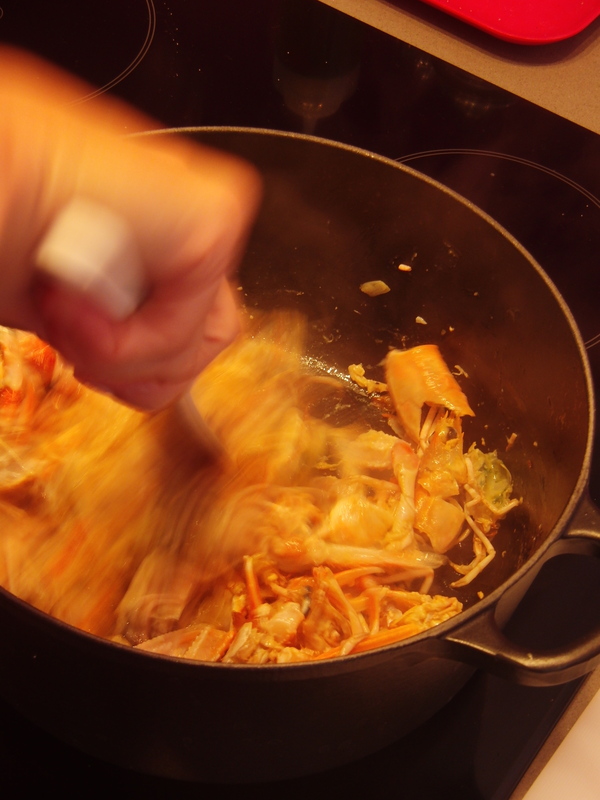 Drain the sauce through a chinois and press to get the most out of the carcasses stock. Add the cream. Turn the flame down and cook the stock for 15 more minutes until reduced, leaving it alone. Cook the raviolis by bring a large pot of salted water to a boil and poaching the raviolis for 1-2 minutes. Drain them. 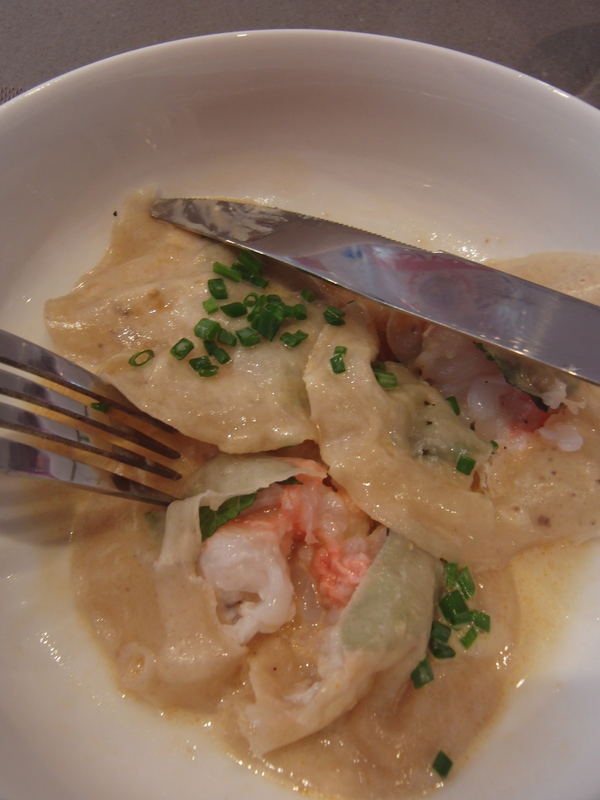 Place the raviolis in a soup plate and pour the hot langoustine sauce over them. Garnish with chopped chives. 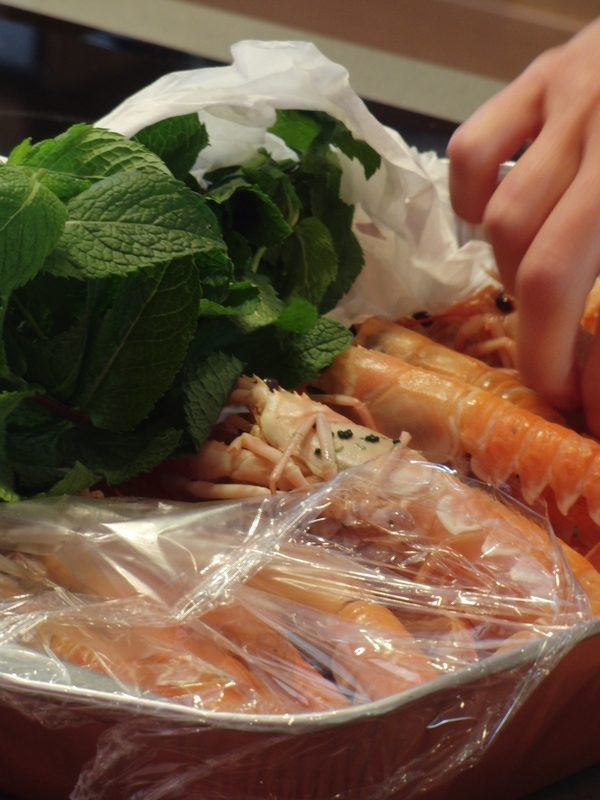 Start with a mint leaf, then a langoustine, then salt and pepper. 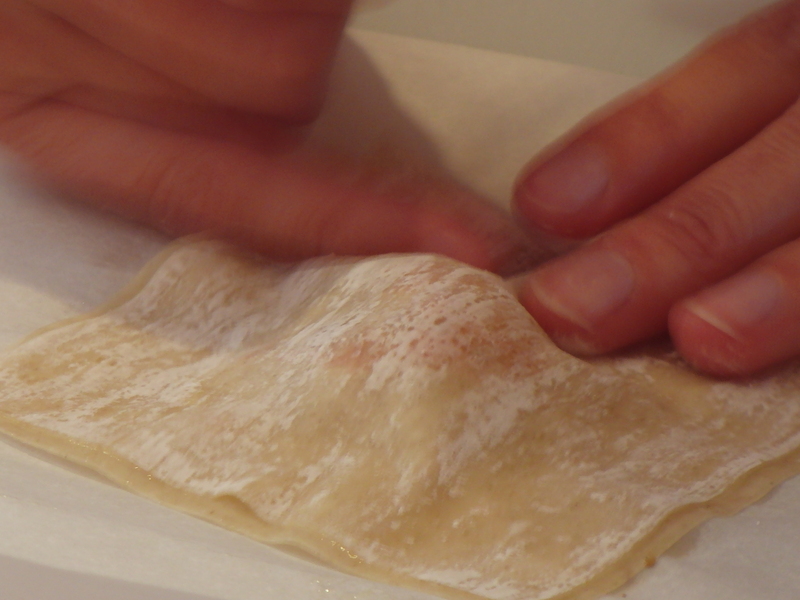 Brush the edges with egg wash and seal with another ravioli sheet. 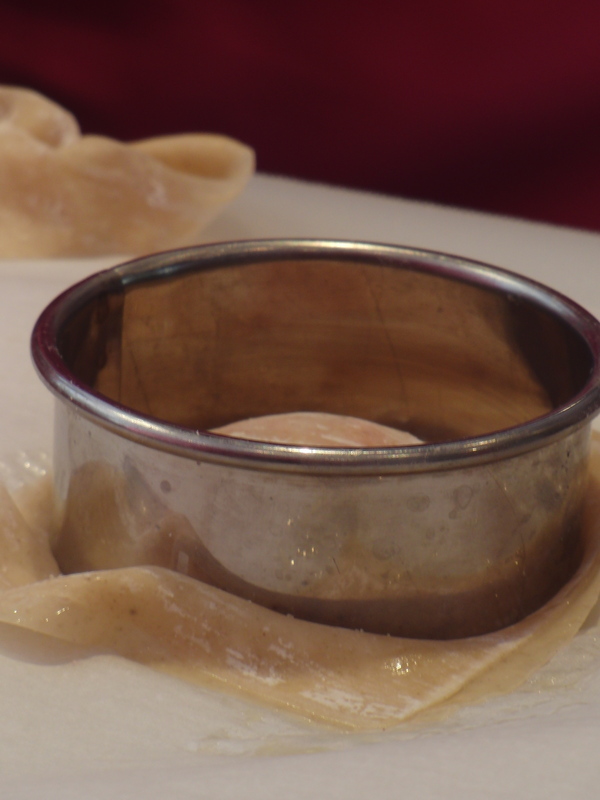 Use a round instrument to cut the raviolis into circles. If you don’t have a mold, the rim of a glass works just fine.